with all due respect to you and these writers, you should really figure out how to put up flicks instead of links. its not that hard and its worth the time. mas, my mistake, I think you are right... .I got that as a response when I was searching for dero stuff..
ETHREADZNY, GREAT IDEA FOR A FREEKING THREAD. 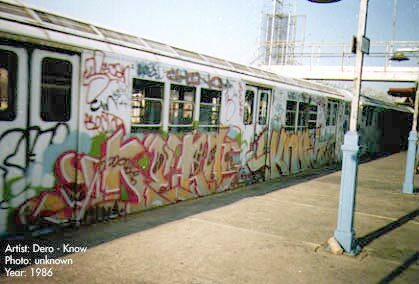 THERES ONE DERO PIECE IVE YET TO SEE IN ABOUT 8 YEARS THAT RAN IN ONE OF THE FIRST ISSUES OF "HYPE" MAG. IT WAS BLACK AND WHITE AN IM PRETTY SURE IT WAS SONE ON A FENCE. IT KIND OF STOOD APART FROM HIS OTHER PIECES IN THAT THE THICKNESS OF THE LETTERS WERE A BIT SLIMMER BUT STILL HAD THE GREAT LETTER STRUCTURE. Because I am up so early, and pathetically addicted to this site, I decided to post somemore dero..
dero is as dope as they come, but did he do those devil characters cause mist does pretty much the same ones now?!?! no, mist did those too. WHY?????!!! why cant graffiti be good like this anymore?! "tc5, tfa... every crew that is a crew"